“Queen” Sayoko sets her romantic sites squarely on Keiichi, who hasn’t been coming to campus with Belldandy, since she is at home preparing a gift for him. However, a jealous Sayoko and other bumps in the road may prevent Keiichi from getting his gift. In the next episode, Keiichi sees a ring he wants to buy Belldandy, and with Urd’s help, tries to find a way to earn money for it. And what role will Sayoko play in this all? In episode four, Keiichi, Belldandy and friends attend a Christmas party at Sayoko’s estate. 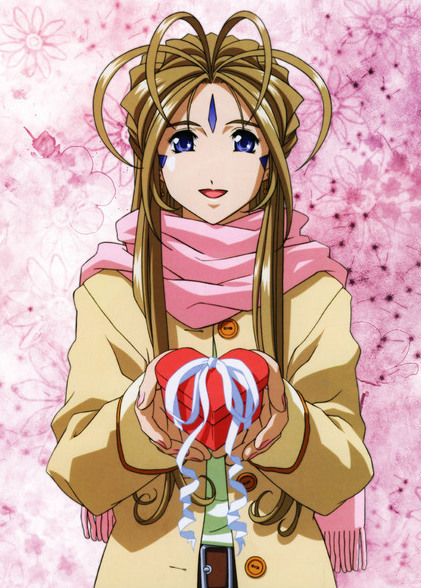 Belldandy become drunk on…Poca-Cola, and causes havoc in the form of spreading too much love around town. Christmas decorations, lots of lighted Christmas trees, “Jingle Bells” background music, gifts, throngs of Christmas shoppers, and snow falling at emotional moments. What you feel with your heart. As Urd says, “Money won’t buy someone’s heart,” and the episodes revolve around giving gifts and other treasures. These episodes remind me of the cornyness of the show – but still, all that corn put a smile on my face. Not too shabby of a message for shows revolving around presents. Of course, nary a mention of the “Christ” in Christmas is given – that would be too complicated in a show where a Christian God does not exist. When Belldandy asks what Christmas is, Keiichi says it’s about a guy named Santa Claus giving away gifts. These episodes can be viewed on Funimation’s Youtube channel. With all these flurries, public transportation (including the train) may come to a standstill. Don’t get caught between a rock and hard place.